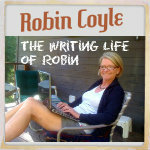 Hi Robin, I hope that you read this as it is an old thread. I was one of those Americans that happened to be there when that woman fell and offered assistance I often wondered about the outcome. I hope that Tara was not given proper information as I’d hate to think she did not survive. I told someone the story of helping a woman who had fallen and, with technology being technology, within seconds she had found your blog. I have looked elsewhere for information on the woman with no luck. Dave’s account is for the most part accurate except neither other woman on the tour with me, the one who took the lead, or I are veterinarians or nurses. But that really isn’t relevant. Like you, I loved my time in Belize, despite this unfortunate incident. I’m glad I found your blog to provide some answers. Technology is amazing in that it led you to my blog post about the horrific accident. That makes 3 or 4 people who have commented on this blog that they where there on or about the time of the accident. What a small world we live in. I’m sure your adrenaline was pumping as you helped the woman. I don’t do well in emergencies (I tend to fall apart) so I’m glad I wasn’t there for it. Thank goodness you were. We fell in love with Belize and made a second trip in May of this year. Instead of the pyramids we did the zip lines and river cave tubing. AWESOME! We were there a few minutes after the woman had fallen. She was attended to by an American veterinarian and a nurse, the only two medical people in the crowd, A pickup truck came with a board that they used as a stretcher. They strapped her in, immobilizing her head and body and then another pickup truck came with a real stretcher but it was too late for that, so they used it to keep the sun off her body as they hauled her away in the back of the pickup. She was conscious but didn’t know what had happened. The vet came down and told us the had broken a leg, arm and ribs. Her shoes were midway on the stairs — they had fallen off as she went down. My guess from my observation was that she was in her mid-30’s. 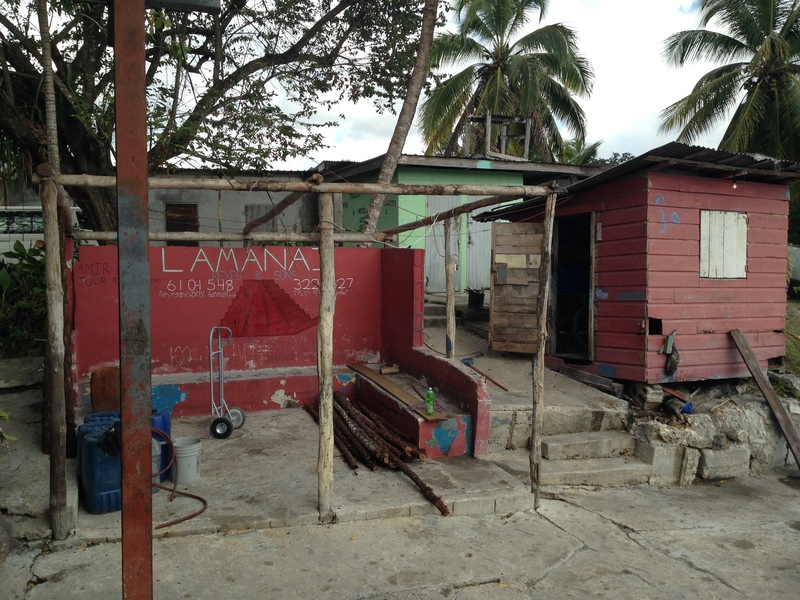 The day was scorching hot and it could have led to her getting dizzy and losing her grip on the rope, The truck took her back to the river and a boat took her upstream to where a medivac helicopter was to land and take her to the hospital in Belize city. She had a traveling companion who went with her, but as to her fate…I don’t know. As soon as the trucks left, they cleaedr the caution tape and people scrambled up the pyramid as if nothing had happened. 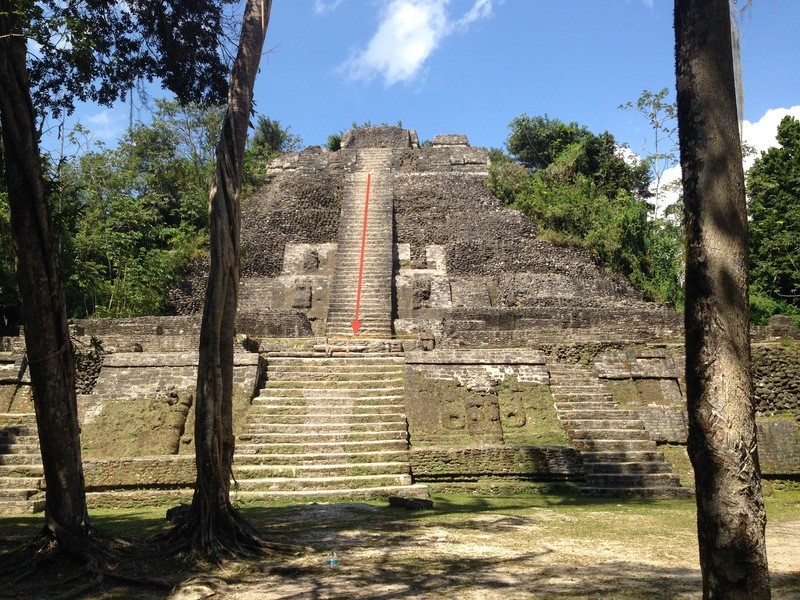 I’m a senior and have climbed many Mayan pyramids, but when I saw how steep those steps were, and a rope, not a metal rail to hold on to, I decided it wasn’t worth the climb to risk falling. If you want to climb high, go to Tikal and use the wooden stairs that they put in place on Temple II and IV. What a coincidence that you were there and found my blog post about it! How in the world did you find my blog? Thank you so much for the report. The accident has been haunting me. I couldn’t find any newspaper articles about it on the Internet. 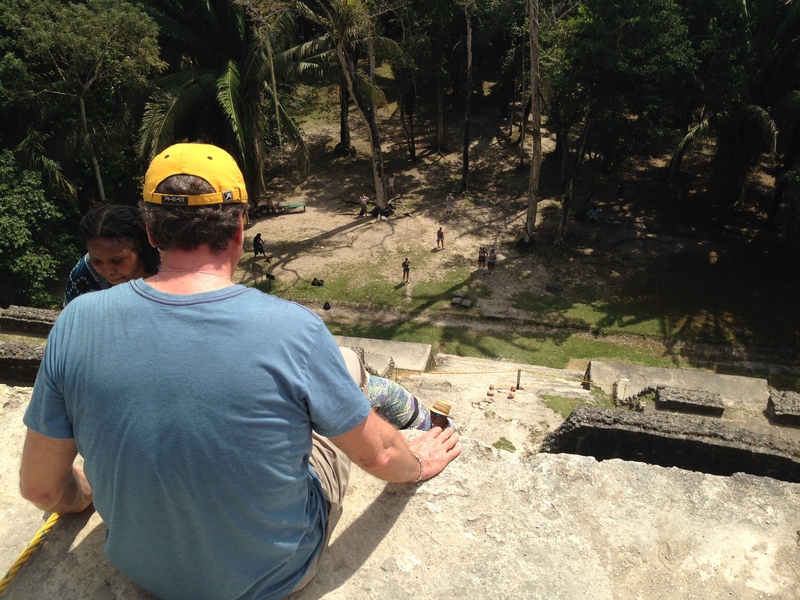 I climbed my first and last Mayan pyramid that day. I’ll stand back at a safe distance and admire them from now on. Found you site accidentally while Googling. I never heard anything about the accident while in Belize. I don’t think they want to broadcast these incidents as to not discourage tourism. We also did the ATM cave which requires some significant climbing on rock faces. Anytime we asked if anybody was ever hurt, they always told us no. As far as what happened to the lady who fell. I don’t think we will ever know. We are going to Cozumel soon and will visit Tulum. Will watch our steps. By the way, when I climb Mayan pyramids I carry my Leki Wanderfreund walking stick. Excellent for safe trekking visitng Mayan archeology sites. That’s terrible about the woman. I can understand how someone could lose her balance on those pyramids. I can barely look over a second-story balcony, never mind something that steep! Yeah…forget Belize…Rick won’t go because to the crocs and snakes…he’s deathly afraid of snakes…kills any that he finds in the grass which is usually one or two each time he mows. But he is amazingly brave when he has a lawn mower or weed-wacker in his hands. Sadly, they are too big to fit in his suitcase. We’ll have to find a different ruin. He could always carry them on. Fitting them in the overhead compartment might be tricky, but he could take the handles off. You didn’t answer my question about your blog . . .
Those remind me of the steps of Chichen Itza in Mexico. We climbed those years ago though I don’t think tourists can make that climb anymore, either. A good thing, because my knees would no longer be pleased with such an assent. I’d be that woman falling 85 feet for sure. The climb was harrowing. The descent was a nightmare. But I’m happy I crossed it off my list of things to do. Next up . . . sky diving. Not really, but I wanted to impress you with my bravery. Another great post and an adventure for the ages. Thank you. It was an adventure and not falling off a pyramid was a coup in my mind. Archaeologist Dennis E. Puleston was killed in 1978 while standing on a pyramid at Chichen Itza in Yucatán. He was struck by lightning from a storm some miles away. He had taken his children up the pyramid to watch the storm. They were met with a far more disturbing sight. 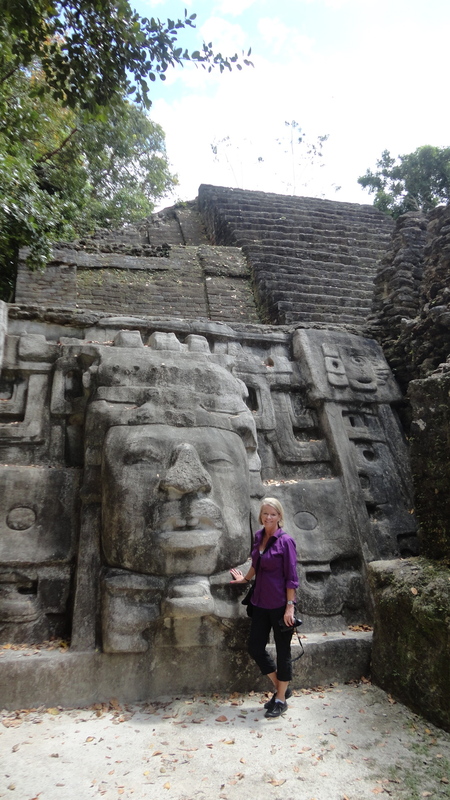 Having worked on both Maya and Aztec sites as a graduate student, I know firsthand that Maya ruins are spectacular. But anyone visiting them should be extremely careful and observant of the surroundings. Venomous snakes and scorpions abound. The monumental steps are steep and often slippery. One misstep can easily lead to serious injury or death. Good medical care is usually hours away—too many hours when serious injuries or deadly snakebites are involved. The incident your guide related could easily have been true, not just a story to scare the tourists. Oh good lord!~ Imagine watching your father get struck down by lightening. How awful for his children. That is so cool that you worked on Mayan and Aztec sites. How long did you do that? I want to hear more about that. Sounds like an idea for a blog post for you! It is sad that they don’t have funding to unearth more of the site we visited. It seems like graduate students would be willing to PAY for the chance to work on them. The area is so rich in archeological treasures. Having been one, I can tell you very few archaeology graduate students have money to spend like that. 😉 I was fortunate to get small stipends and department grants to go to Honduras and Mexico for several years. And there’s a lot of competition even for tenured faculty for the limited grant funds available from places like the National Science Foundation. A lot of Americans would probably think too many tax dollars go for that research as it is, I’m afraid. Then there are the bureaucratic headaches of dealing with the local governments. What I saw was too much for me, and I switched to North American archaeology. Like I said, I think your adventures would make a fascinating blog post. The climb requires well-oiled knees and a reckless disregard of fear of heights. Fabulous! Truly. My sons and I climbed the big pyramid in Mexico, it was daunting even for them. It was worth it though. I am glad you made the climb, come on now aren’t you glad? Yes, I am very glad I climbed it. My 2 second view from the top was spectacular before I got the heck off the thing. It is too high. Too damn high. Now you tell about the whole snake thing. Remind me to never take a boat ride through the jungle again. The pyramid was deceptively high. I’m glad I climbed it and even more glad I never have to do it again! Wow, I had no idea they were that steep. I’m impressed that you climbed them. This girl is too out of shape for such a climb. When you were naming movies, I was glad to see you didn’t say Deliverance. Whew. I would have said Deliverance if I had thought of it! The pyramids are impossibly steep but my adrenaline propelled me forward. You have to climb down them backwards, like a ship’s ladder. Never again! Looks fantastic. I’ve always heard great things about Belize. How funny. I was just over at your pad. Weird how that happens. Part 3 will be coming up in a few days. I need to give you all time to relish the words of Part 2. I’m ready for Jeopardy, particularly if it’s the ‘did you know?’ week where the contestant can show a bit of personality and humor. I enjoy how you show your readers a site, but give it a bit of a humanistic slant. Brave you – and what a fabulous trip! I can’t wait to go back to Belize. We may make it an annual trek. There is something special about the pace (low-key), the soft air, and the aquamarine Caribbean water. How about tomorrow? My bags are packed. Glad you’re still in one piece! Aren’t those howlers crazy? They love making noise in the wee hours of the morning. 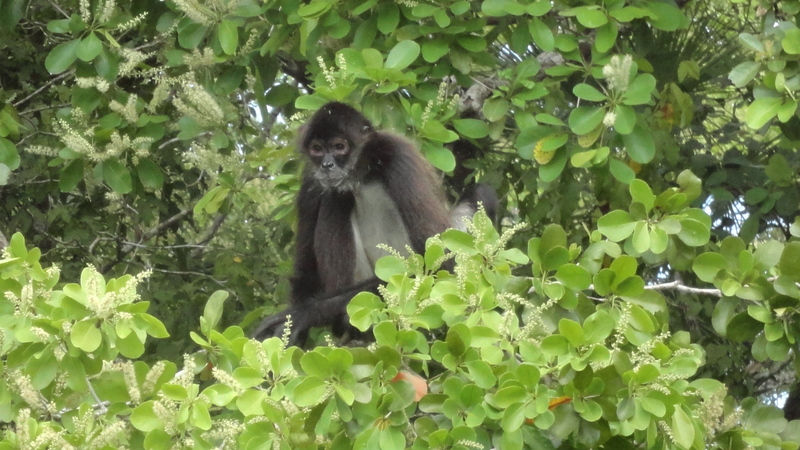 Fortunately there weren’t any monkeys on the island resort where we stayed. I woke to the sound of lapping waves on the beach. Or maybe it was my husband’s snoring. You’re brave. There is no way I could get down once I made it to the top. Too scary. Facebook page …you crack me up. No . . . once you make it to the top all you want to do is get the heck down. And FAST. I think the Mayans also have an Instagram account, are active on Twitter, and have been known to Snapchat a virginal sacrificial offering a time or two. That’s a scary view from the top there! I would hate to hear that story about the woman too, it’s worse I think to hear it was just a couple of days before. I’m not sure it was necessary to tell you. Hey, maybe it’s not true at all, maybe they just say that to scare people into taking extra care. Yes, that’s it, let’s go with that. I wouldn’t like the snakes above, eek. More pictures needed though Robin! Yes. Perhaps instead of safety precautions, they use scare tactics. I believe that was my mother’s method of keeping me safe was as well. More pictures to follow in the rest of the series. Sadly, the photos don’t do the beauty of Belize justice. You will be glad to hear there are zero pictures of snakes and the crocodile photos didn’t turn out because they are the same color as the water. I’m happy to report there were no seagulls in Belize. I couldn’t survive a climb like that without the security of a large rope or two and a crane. Outstanding you made it to the top. No wonder your legs shook afterwards. Good thing you didn’t fall. Wonderful story. I always had the idea Mayans were clever and colorful. Going up was arduous. Coming down was petrifying. I’m glad that I did it once and don’t have to do it EVER again! It is sad that so little of the site is uncovered. It truly is a national treasure and awe-inspiring. I can’t take the altitude or the heights or minus ropes and pulleys. Would be awesome to see though. I could have gone all day without the story about the woman falling. It put the fear of Mayan gods in me. It is interesting how many civilizations, 1,000s of miles apart, felt the need to build pyramids. The Angkoreans didn’t build pyramids per se, but their mountain towers did have those perpendicular stairs! Even after being told about the fall and the need to use the rope, one of the woman in our group didn’t! I was right behind her and had visions that if she fell, so would I! Tell me more about snakes launching themselves. No don’t. I want to go back to Belize and facts about launching snakes might put me off. Completely fascinating! I’d heard the steps were very tall and very vertical….very scary. You are so lucky to have gotten there before some safety group closes it …or constructs an easy access ramp…which would take away Maya reality perpective. Only with a person standing there do you realize how big the carvings are. I’m not crazy about heights, but the story about the woman falling made it 10 times worse. I can’t find anything about how she is doing. The guide said her injuries were bad. Very bad. I have lots more pictures but I hate to bore you all to tears. More picture – we only weep out of envy! There will be more photos in future posts about the rest of the trip. As beautiful as Belize is, pictures don’t do it justice. I was there, a few weeks later. Our guide told us, “She succumbed to her injuries.” It was terrifying to contemplate. We climbed it (me, my husband, and my 12-year-old daughter). I felt like the worst mom in the world when we got to the top because you don’t realize how steep and how high it is until you get up there, but my husband and daughter kept telling me it was fine, and I didn’t want to ruin their opportunity. Bear in mind this is all before we found out about the lady who died. Also, there’s kind of a surreal, Disneyland adventure feel to the whole experience, and when everyone else just starts climbing, you figure, “Well I guess this is what people do.” I know, I know, I’m an idiot. I will NEVER do it again, and I’m just so grateful to God my family and I made it down safely. I wish the authorities would do something about that climb to make it safer to stupid people like me. Hi Tara! How in the world did you stumble upon this old blog post of mine? I am so sad to hear that the woman did not survive. My knees were truly quivering when we reached the top and then I couldn’t wait to get down! I’m glad we did it, but like you, never again! Wanna hear something weird? I was wearing the same outfit yesterday when you commented. I don’t think I have worn that combination since that trip!